There are various reasons why physicians order laboratory tests. In teaching institutions and academic centers, residents often order many unnecessary tests for patients. Earlier studies have shown that in many cases test‐ordering behavior lacks efficiency, resulting in excessive laboratory utilization. Throughout the years various attempts have been made to improve this situation with mostly very low success. Various reasons for such a behavior include lack of accountability, anxiety over uncertainty, and unawareness of economics of test ordering. We aimed to evaluate the impact of education and weekly feedback on ordering pattern of blood work for physicians in training. We performed a retrospective analysis of a performance improvement project. During the first part, from June 15, 2011, until March 2012 (41 weeks), we collected data on ordering pattern of laboratory ordering for medical residents. In March 2012 we performed an educational session regarding laboratory ordering. Afterward, from April 2012 until November 2012 (35 weeks), we sent weekly e‐mails to each medical resident. The e‐mails were anonymized and contained a personalized code known only by the medical resident and the laboratory medical director. The content of the e‐mail was the total amount of labs ordered by the medical resident during the past week, the total for all residents. From April 2012 until July 2012 it also contained the running average for residents on similar rotations. There were 105 residents included in the project. The average number of tests ordered per week was 4239 (±461). For the following study period there were 3605 tests ordered per week (345). A 1‐way ANOVA test showed a significant difference between periods. The difference was 634 tests per week. We constructed a control chart and identified special cause events that indicate a significant change from the time before and after the intervention (see Figure). A simple weekly feedback to internal medicine residents significantly decreased the total number of laboratory tests ordered over time. Further studies need to be performed to evaluate whether these findings may be seen for other specialists and for physicians not in training. 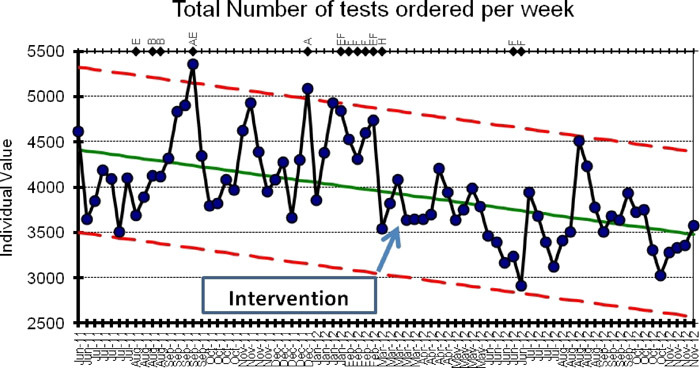 Rachoin J, Cerceo E, Bierl C. Impact of Weekly Feedback on Number of Laboratory Tests Ordering in Internal Medicine Residency. Abstract published at Hospital Medicine 2013, May 16-19, National Harbor, Md. Abstract 104. Journal of Hospital Medicine. 2013; 8 (suppl 2). https://www.shmabstracts.com/abstract/impact-of-weekly-feedback-on-number-of-laboratory-tests-ordering-in-internal-medicine-residency/. Accessed April 21, 2019.